Tokyo Ghoul continues to redefine the definition of “gourmet” as Tsukiyama finds even more gruesomely spectacular ways to attempt to eat Kaneki. Tsukiyama may have tried to kill Kaneki before, but ironically the fact that Kaneki is a half-ghoul saved him temporarily. However, Tsukiyama did not spare Kaneki out of good will; he merely wants to eat him by himself. Meanwhile, Nishio is struggling to heal from earlier wounds, and his girlfriend Kimi comes to ask for Kaneki’s help. Unfortunately, Tsukiyama sees this and thinks that Kimi is important to Kaneki and kidnaps her. Kaneki is left with no choice but to meet Tsukiyama, with Nishio following closely behind. Luckily for Kaneki, Touka, who is evenly matched with Tsukiyama, finds out and gets involved. Following Tsukiyama’s attempt to eat Kaneki in the previous volume, Kaneki is reasonably on high alert. Of course, this does little to prevent another encounter with Tsukiyama, this time in a slightly more direct fashion. The bulk of this volume is about the face-off between Tsukiyama and team Kaneki, and while there were a few minor skipped beats I felt that for the most part the book was a solid addition to the series and managed to more-or-less resolve what feels like a relatively minor arc of story pretty effectively. 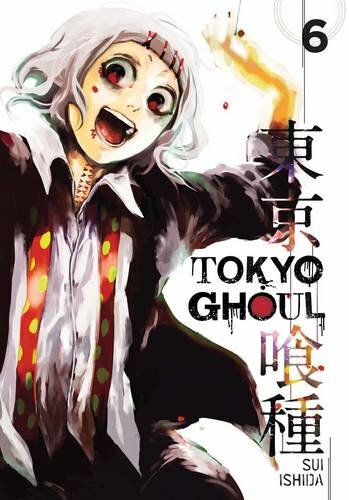 Tokyo Ghoul has had a trend in its first few volumes of offering a series of alternative relationships between humans and ghouls to demonstrate a sort of comparison for readers between different perspectives. I’ve found this to be an effective way of fleshing out the alternate reality Tokyo that the series takes place in as it adds depth to the primary dynamic of human and ghoul that would be impossible to do with just violence. In this case, surprisingly, it is Nishio that offers his own take on the human-ghoul relationship as it turns out he not only has a human girlfriend but he actually has legitimate feelings for her. Unlike Kaneki’s Hide and Touka’s Yoriko, Nishio’s girlfriend Kimi actually knows that he is a ghoul and doesn’t care. The mutually aware co-existence of the pair is a distinct contrast to other known human/ghoul pairings in the series and is an excellent example of the idea the series pushes thematically that understanding could lead to peace. My personal favorite sections of the volume were the backstory portions. Nishio’s backstory is explored midway through the fight with Tsukiyama, and it was quite effective. The story had two portions: Nishio’s early history, and how his relationship with Kimi came to be. Nishio’s early history, including his tragic upbringing and earlier education, effectively added depth to what was previously a fairly one-note character. His relationship with Kimi, while slightly rushed (six pages total) was arguably the most emotional portion of the volume. The two stories combined set up Nishio’s background in a way that actually made him quite a surprisingly sympathetic character and added substantial emotion to what is otherwise a relatively aggressive fight with Tsukiyama. The second backstory involves Rize from the short period of time before she was killed while attacking Kaneki in the first volume. Rize’s chaotic disposition was illustrated in much greater detail in this chapter, and although as an individual she is a relatively simplistic character, it’s her predatory tendencies and what they represent that are really the most interesting elements of her characterization. The mindset of killing for pleasure as a natural predator conflicts greatly with Anteiku’s philosophy and her past seems to continue to contain details that effect the present story. In a way, Rize post-humously seems to be driving the plot, and her actions when she was alive essentially set the stage for the series in the first place. Of course, although these stories are interspersed throughout the volume, the primary conflict is the battle between Tsukiyama, Kaneki, Nishio, and Touka. While the most basic reason for the fight is a bit simplistic (Tsukiyama wants to eat Kaneki), the fight served as an excellent emotional battleground on top of a physical one. With Nishio’s backstory in place, his all-out defense of Kimi has extra romantic flair that made his emotions very impactful for me. The illustrations are definitely a highlight of the battle as well, as the extremely fast-paced and supernatural attacks of the characters is very difficult to pull off, but author Ishida manages quite well at drawing dynamic action that is relatively easy to follow and breathtakingly intense. Tokyo Ghoul is just as gruesomely violent as ever in this volume, although I’ve got to say that it seems really tough to tell whether or not a critical hit has landed on a ghoul as they really take quite a bit to actually kill sometimes. 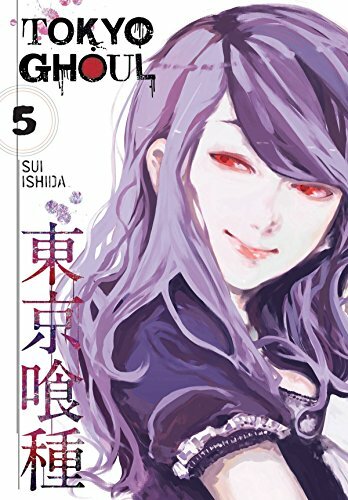 Although Tsukiyama’s character isn’t really explored any more than what was previously revealed in the fourth volume, his psychotic behavior and Touka’s fight with him were still very engaging to read. 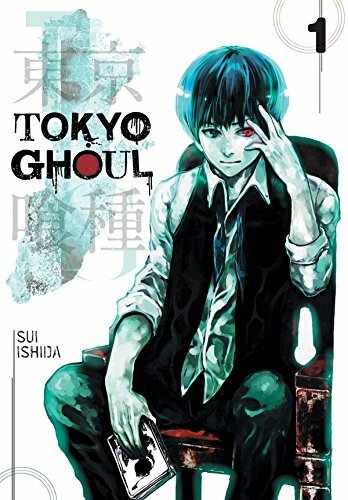 Tokyo Ghoul is always one of those series that has a very steady line of quality with each release, and this volume is no exception to the rule. Although the primary conflict in the book is the fight with Tsukiyama, the interlaced backstories and character progression made for an excellent mix of emotions and dynamic fighting. Although Tsukiyama’s arc feels like a relatively minor story in the whole scheme of Tokyo Ghoul, it has definitely been no slouch. If you’re a fan of a series, then naturally I suggest picking this one up. Tokyo Ghoul began serializing in Shueisha’s Weekly Young Jump magazine in September of 2011 and concluded at the same time in 2014. A sequel manga named Tokyo Ghoul Re: is currently being serialized, and the original manga received an adaptation by Studio Pierrot in Summer 2014 and a second season in Winter 2015. 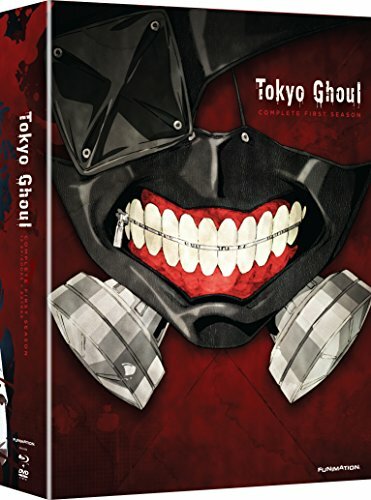 VIZ Media publishes Tokyo Ghoul in North America translated by Joe Yamazaki, and released the fifth volume on February 16th with a planned release of the sixth volume in English for April 19th.